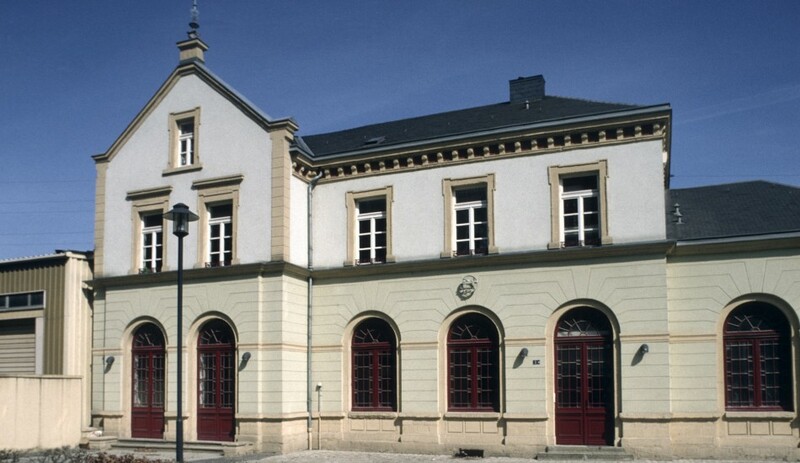 During the Nazi occupation of Luxembourg (May 1940 – September 1944), the train station in Hollerich served as one of the main gathering sites and departure points for young Luxembourgers forced to join the German labour service ( the “RAD”) and the German military service. Furthermore, thousands of politically unfavourable Luxembourgers were deported from Hollerich. A part of the Jews who were living in Luxembourg were loaded into the trains only a few hundred metres from this point and were displaced to ghettos or death camps. Today, the train station in Hollerich is dedicated to the Luxembourgers who were forced to enter the German army, as well as to those who were deported and to the Jewish victims of the Nazi regime. It is where the « Centre de Documentation et de Recherche sur l’Enrôlement forcé”, the « Comité directeur pour le souvenir de l'Enrôlement forcé » and the « Fondation du Mémorial de la Déportation » reside. To honour the memory of the victims of the Nazi regime, the Hollerich train station accommodates an educational and interactive museum accessible to the public. are welcomed from Tuesday to Friday, starting at 9 a.m. until 11.30 a.m. and from 2 p.m. until 4.30 p.m.
are scheduled on Tuesdays and Thursdays, from 9 a.m. till 11:30 a.m. and from 2 p.m. until 4:30 p.m. and must be reserved by contacting our office at +352 2478-8191.